It’s all over the internet, books and experiences many mothers have to share. And a lot of these breastfeeding resources available for mothers focus on how beneficial breastfeeding is for the child and how mothers can cope with breastfeeding but what many, especially new mothers, may not expect is that breastfeeding can help mothers cope with motherhood. Those blurry and utterly exhausting days and nights I had whilst struggling through the critical early parts of breastfeeding? Totally worth it for me. 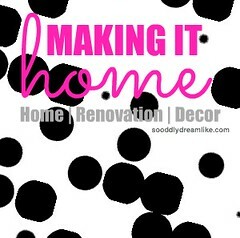 Trust me, I totally get the it’s-ok-to-let-baby-wait-awhile-lest-you-spoil-him/her thing. Totally. And I actually agree but, I’ve discovered, that it really depends on the baby you’ve got on your hands. 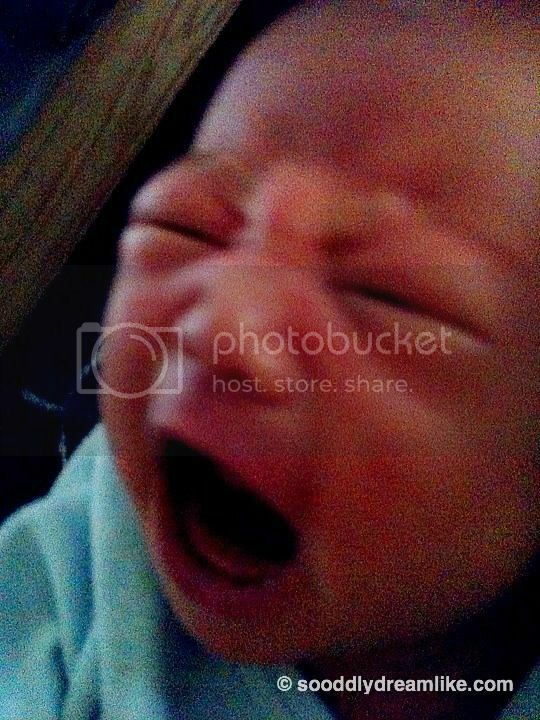 I’ve got a fierce little one who doesn’t quite cry like most babies I know. First she looks like she’s crying with an open mouth, but makes absolutely no sound at all. Then she holds it until she turns a dark dark red and before you can count to three, she lets out a deafening, high pitch scream before proceeding to cry like most babies I know, except very much louder. If you have a child like mine, you’ll understand the need for MILK. RIGHT. NOW. Then let’s talk about the worse case scenario in my case. I have a going-to-be-hungry baby, no gas, no clean bottles, run out of milk powder, the brand of milk powder my baby is used to is not sold anywhere near me, my baby rejects the milk powder I eventually bought. And make that happen at 2am in the morning. I can’t even imagine. Breast-feeding saved me from all that. All I need to do is to pull my top down and latch. To say that I travelled light even though I probably had everything needed for JoyJoy whenever I’m out is an understatement. 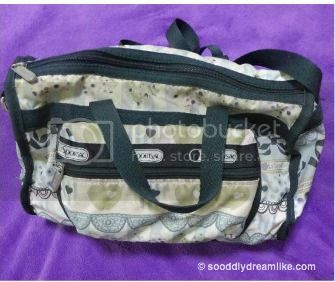 (2) My small Le Sports Sac sling bag holding 4 diapers, nappy rash cream, a foldable nappy changing mat, a change of clothing for JoyJoy and my wallet. Sure, the diaper bag still got heavier when JoyJoy started on solids but that’s also when every bit of extra weight you can remove counts. No hot water flask and no milk powder makes a difference. Breastmilk from the tap is probably the most reliable source of milk. I’ve never had to read labels, do research on formula or worry that that JoyJoy’s milk is a health concern and because of that, when we brought JoyJoy on a trip to Taiwan before she turned 5 months old, there was not a worry on my mind about how we were going to have clean milk for her. In fact, I took comfort in the fact that if any one of us were sick, her best “medicine” is the breastmilk I could give her. Nursing in public easily when in Taiwan. Could you tell that she was nursing at all? Having reliable milk on the go also meant that our travel itinerary was not affected at all. We went on a free and easy 8-day trip up the mountains to the highest point of Taiwan and back down with no problems caused by feeding at all. Unless one can direct latch all the time, I won’t say that breastmilk is free. It is not. You have to factor in the cost of your breast pump, bottles (albeit lesser bottles) and milk bags but raising a child on breast milk is definitely cheaper than raising a child on formula. The $450 we spent on my breastpump plus around $100 for the rest of the equipment I needed to express milk at work adds up to about $550. I’ve been breastfeeding for 20 months as of today so it works out to $27.50 a month. The figure goes lower, the longer I breastfeed. A tin of formula, which must be consumed within a month after opening, costs between $50 to $70. This is at least twice as much as it would cost to breastfeed, provided your child takes only one tin of formula a month. To be very honest, I really didn’t feel a bond with JoyJoy the minute she was born. It wasn’t like that for me. Sure, she was mine, I’d give everything I could for her but the feeling of being close? Not there right away. So I imagine, it might be like that for her as well. Maybe, it was a possibility. For the first month or so, as I grew more and more attached to the little girl, I grew slightly worried. I’m about to return to work, what if JoyJoy loves her alternative caretaker more than me? For us, JoyJoy’s alternative care-taker is her paternal grandparents. In a sense, it’s alright for the little girl to love them but I wanted her to love me the most, if you know what I mean. Turns out, like what I learnt in breastfeeding course, from the internet and books, there was no need to worry at all. Even though JoyJoy spent only 1 hour (at most) with me daily as compared to the many hours with her alternative care-takers when I held a demanding job, it was obvious that her favourite-est person in this world is me. A nursing mother and her child has an inexplicable closeness. The child trusts you and wants you. That’s not all, I’ve discovered that the older you nurse a child, the closer the bond is. Now that JoyJoy is able to converse with me using simple words, she tells me that the breastmilk is “GOOD!” with a thumbs up hand sign and a big kiss. When nursing, she caresses my face, stroke my hair and hugs me close to her and there are some things we would both understand, like when she holds my nose during nursing, I’d say “Hello JoyJoy! I love you!” and then we’d burst out in a laugh together. And when we’re out, people always comment on how close we are. The little girl would give me random hugs and go “BIG HUG!” or “HUG HUG!”, just because she feels like it. Or she would hold my face with her palms and kiss me. Or when I’m hurt. She shows a sense of urgency to run to me to give me a tight hug and then, the most lovely part of all, un-hug me once in a while to see if I’m alright already. True story. It’s an incredible feeling to be so, so close to her. She loves me. She loves me lots. Most, most importantly, I have a special way to right things in her world. Tired? Sick? Fell Down? Nightmare? I nurse. She gets comfort and nourishment at the same time, especially important when she is sick and rejects food or water but needs to keep hydrated or when she is ill and needs rest but cannot shut down. When a child is sick, any relief a mother can give is a relief to the mother herself as well. 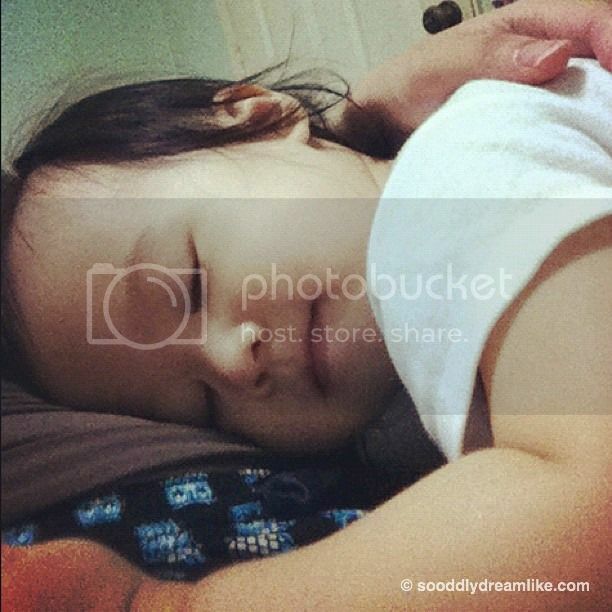 A nursing child is comforted, secure and at peace. And so is her mother. So, if you are a new mother, I strongly, strongly encourage you to nurse. Not just for your child but also for yourself! If, like me, you and your family have benefited frombreastfeeding your child and you would like to do your part to promote breastfeeding, or if you are curious / want to learn more about breastfeeding or even if you just want to check out the great programs and deals available, I would like to invite you to nurse with pride or just join us at The Big B Event –Mass Breastfeeding Challenge at the Parents World Exhibition 2013. 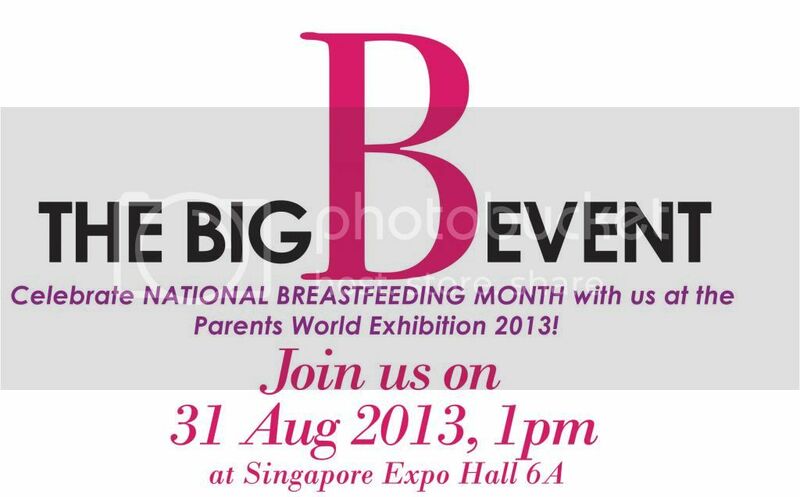 The Big B Event is a challenge organised by Parents World magazine to set a new national record with the Singapore Book of Records for the most number of mums breastfeeding together. 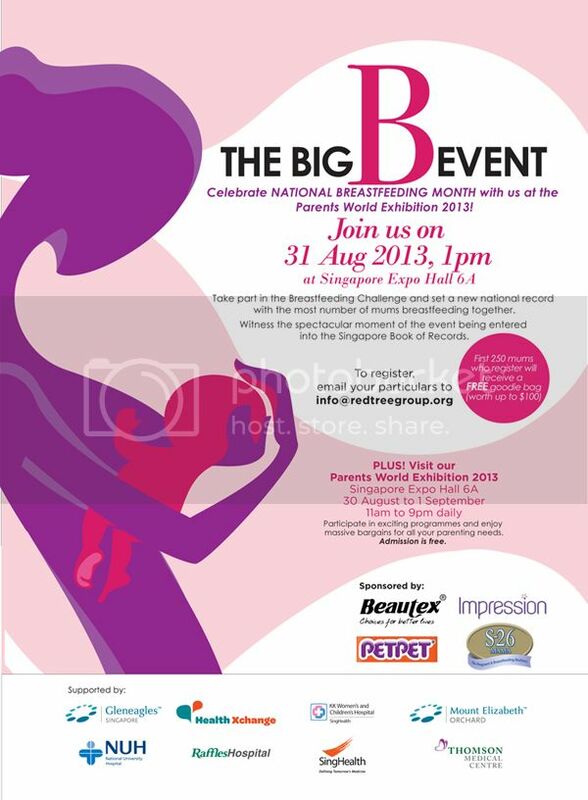 The Big B Event serves to raise awareness of the benefits of breastfeeding and to encourage mothers to breastfeed their babies for the first 6 months, or more if mother and child would like to. For all mothers who are keen on breastfeeding, take part in this meaningful challenge and celebrate National Breastfeeding Month with us! 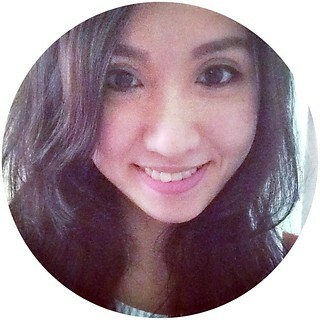 31 August 2013 (Sat), 1pm at Singapore Expo, Hall 6A. This massive record-breaking event is open to all mothers and their babies. Be present to witness the spectacular moment of the Big B event being entered into the Singapore Book of Records. Sign up to be a part of this exciting challenge now! To register, email your particulars to info@redtreegroup.orgor call 62950810. Also, check out the event Facebook Page here! The first 250 mums to register will receive a FREE GOODIE BAG WORTH $100 with products from Impression, Beautex, PET PET and S-26 Mama. This event is part of Parents World Exhibition 2013, an annual event for mums and dads organised by Parents World, one of Singapore’s leading parenting and lifestyle magazine. This three-day exhibition will be the one-stop solution for all your parenting needs. Parents can look forward to exclusive deals from exhibitors and clinch parenting essentials at massive discounts from big brands like Abbott, Mead Johnson, Dumex, Drypers, Pampers, Huggies, PET PET and lots more. 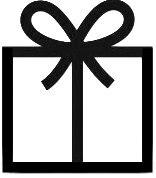 Filled with exciting programmes, a wide range of booths as well as attractive prizes to be won, parents are sure to have a blast shopping and having fun! So remember! 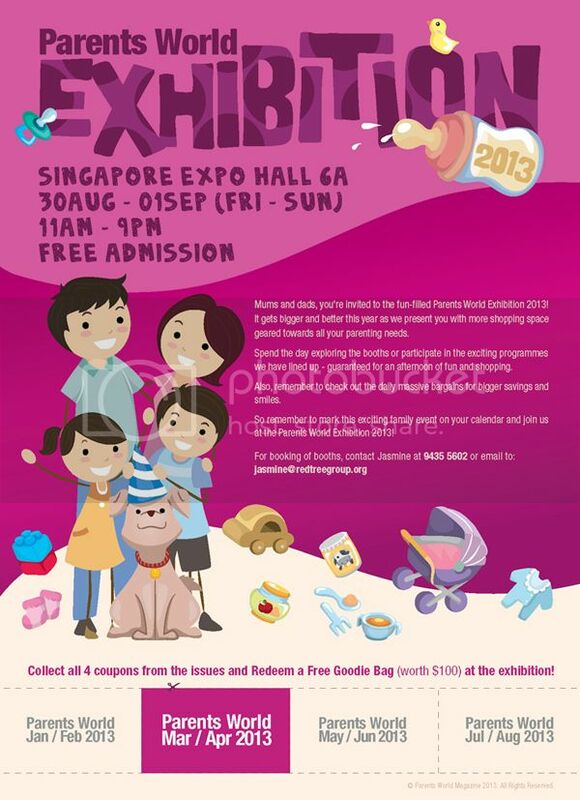 Come down to Singapore EXPO Hall 6A for an entertaining afternoon of family bonding from 30 August (Fri) to 01 September (Sun) 2013, 11am to 9pm. Admission is free. Disclosure: I have been compensated for this post but the passion for breastfeeding, the breast in the last picture and all opinions are my own.